People had been living at the site since Saxon times. Built by Augustine monks and commissioned by Gilbert L'Aigle the Priory was a place of peace and worship, completed in 1229AD. The monks harnessed the river that flows past the Priory by building a mill and traded using the busy waterways. The church of the holy trinity stood over the Priory, and the monks prospered. By the fifteenth century England had begun to change, and attitudes towards the monks lead to the construction of the defensive moat and gatehouse that bears the eagle of the crest of L'Aigle. The Priory became a fortress as the monks sought to defend their self-sufficient and peaceful existence. In 1529, tired of the power and influence of the church over the crown, King Henry VIII initiated the dissolution of the churches and Michelham Priory was marked for attack. The Augustine Monks could not defend against the Kings men and the Priory was taken and the church of the holy trinity destroyed, it is not known how many were killed during the attack. This time the property was bought by the future Earl of Dorset, and it remained in his family for the next 300 years. Perhaps it was the history of the building, but few people called the Priory home and the earl let out his property to farmers who built new buildings and utilised the mill and river trade. 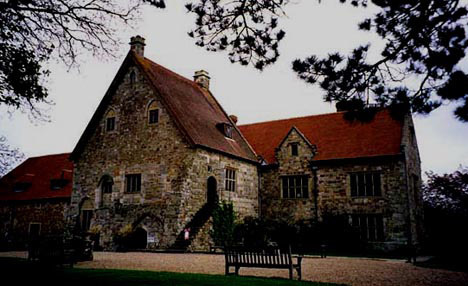 After the decline of the river network, the Priory again stood empty and went through a series of owners before it was bought for the last time in the 1950's and was donated the Sussex archaeological society. A tyrannical male presence as also said to dominate the house and this character is thought to be Robert Henry Sackville, a direct relation to the Earl of Dorset. Psychics have often commented that there seemed to be a very negative atmosphere within the original parts of the building that dates back to before the property entered the keeping of Mr Sackville. Michelham Priory is open to the public as a industrial tourist attraction, and plays down its disturbing history, though it does truly possess a foreboding atmosphere.